I need some wool combs. I tried combing for the first time at the workshop in Ringwood, and I really liked the result. 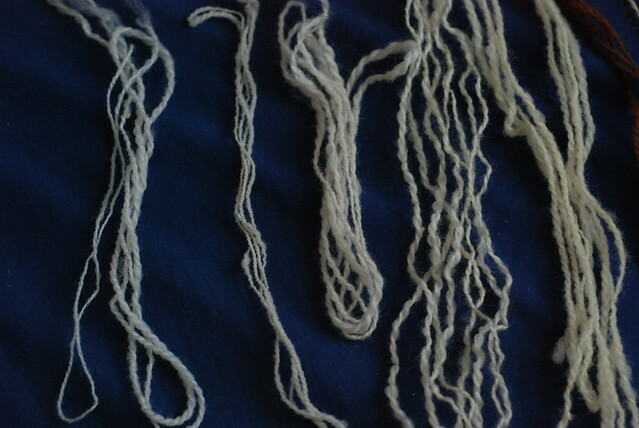 I've often had trouble spinning evenly from rolags - the results can be OK, but I end up with lumpy yarn. 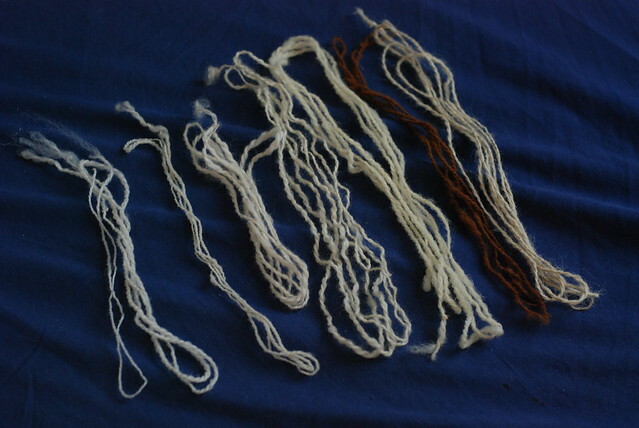 My preferred method of fleece prep up until now has been flicking and spinning from the lock, which works really well unless your fleece has variations (in length, or texture, or color) - then one length of yarn can be very different from the next one. In the grand scheme of things, a set of combs is not that expensive, especially when I can tell I would get good use out of them. Still, a quality pair of combs is an investment and would wipe out my fiber budget for the month, so I need to save up before I plunge in. Still, I'm not very patient. 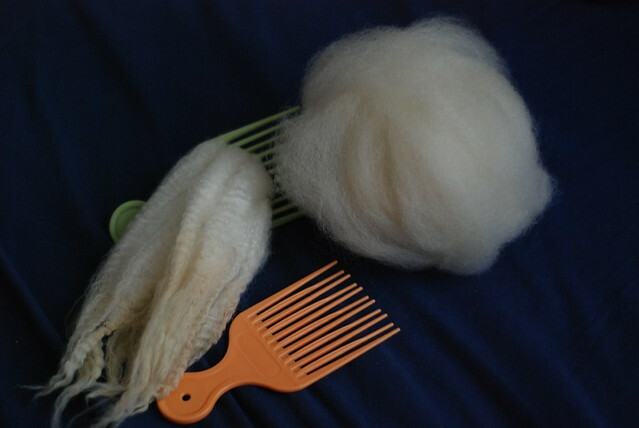 And some Romney fleece arrived at my doorstep - long, lustrous, and quite crimpy too. So I decided to experiment with what I had around the house and make some ersatz combs. Two plastic hair picks, the kind you can get for cheap at your local drug store. They're not sharp, not sturdy, and not particularly ergonomic. They don't hold much fiber. But, they'll do for an experiment. And as you can see, they worked! I managed to produce a ball of fluffy, smooth, spinnable top from my Romney locks. Hair picks are to wool combs as dog slicker brushes are to hand cards - not the best way to do things (they don't hold much, not very durable, not designed for the job) - but a way to experiment and try it out without a big investment. Yep, I loved the results. The smooth texture, the sheen, the evenness I was able to achieve, the way I can comb bit after bit and roll them into one big ball of top, rather than flicking out each lock separately. I'll be able to be much more productive once I get my proper combs - but these experiments have been really fun and enlightening too.